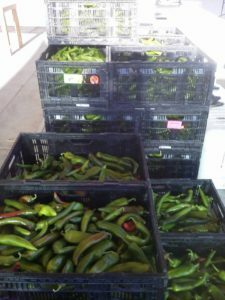 We have frozen roasted green chile in the Harvest Boxes as subs this week. It has a good kick to it so I didn’t want to “force” it on anyone. But we will have it for a week or so (until it sells out)! Gala apples this week too from Excelsior. Wow. Some of the best tasting apples you will find. They’ll keep the Dr. away you know. Recently, I read two articles that really caught my attention and made my mental gerbil get busy in his small cage. First one pointed out that our country is on the verge, for the first time in our history, of spending more of our money on eating out rather than eating at home. The second article pointed out that grocery stores are in a competitive price slashing war right now and that grocery prices are the lowest they have been since the 1960’s. The time of Peace & Love…and apparently inexpensive grocery bills. I have to say that I hated reading these articles; in the time of the least expensive grocery bills, our families are still eating out. Now I am not a purist and you will find me eating out too, but this trend is not good folks. Restaurants are in the business of making money and not making food healthy. Unfortunately, that usually comes in the form of added salt, sugar, calories and portion sizes. Let’s just say that my love handles enjoy when I go out to eat. Additionally, when we as a people are not involved with the harvest or the preparation of our food, we become naturally estranged from our food. There is no relationship with our food when we do not grow or cook our meals. And that shows up in our nation’s health. Let’s just say that I do not think that it is mere coincidence that obesity, diabetes, and health related diseases are following the same line as our country eating out more often. 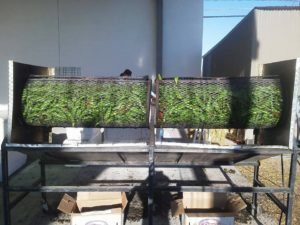 So this led me to look at our farm and our offerings to see if there are things that we can tweak to make our service better for our members and to hopefully help all of us stay in our kitchens a little more. Eat a little healthier and to connect with our families and our food more. I am a firm believer that so many of our challenges both as individuals and as a society stem from our food choices. So what the heck did I find out by putting our service under the microscope? First off, I realized that we have strayed from the uniqueness that I feel is the Harvest Boxes. This farm was founded on the idea of the Harvest Box giving our members a fun, educational, and special eating experience. Over the last several years, I have added all the items in the Harvest Box to our ala carte style of ordering. And because of that, we have seen an over 10% drop in Harvest Box orders from our members. By itself that figure probably doesn’t mean all that much. Folks are still eating healthy yummy food. But to me, the Harvest Box, even with all of its customization possibilities, is our roots to the CSA model that I love so much and believe in so strongly. So to catalyze the revival of the CSA Harvest Boxes, you will see start to see financial incentives that make the Boxes a better value than buying ala carte. This is not to “punish” our ala carte shoppers. On the planning side of our operations, it is much easier for us to forecast demands when we have recurring Harvest Boxes on order. We also receive better “deals” when buying for Harvest Box volume so I want to pass that along to our members. Lastly this week, I was looking at our cost of deliveries. As you can imagine, it costs us the same amount to deliver a $25 order as it does a $100 order. Van stops, driver leaps out like a super hero to bring you the freshness. The cost of that delivery is the exact same for small or large orders. But obviously larger orders are better for us financially. So we added a large order incentive program that will look like this: Order $50 get 5% off your bill, Order $100 to get 10% knocked off your bill. We want to play a big role in your kitchen and your health. My hope is that we can do those while still being nice to your wallet too! Fall Preview and Chile Roast Tomorrow! 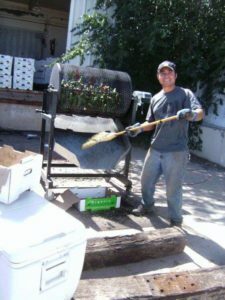 You have got to love the journey of the green chile. From sunbathing in the fields, to the fiery inferno of the roaster. Happy first day of fall. What an incredible time for all of us to enjoy here in the Southwest. And it ends up being a time for change for our food landscape as well. Let me lay this out a bit for you. 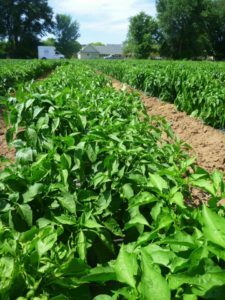 The “Buy Local” food craze that is now over a decade old, has done so much to shed light on the work of small farmers and producers everywhere. The Southwest is no exception. We have seen huge leaps in demand as well as education over the past 13 years. 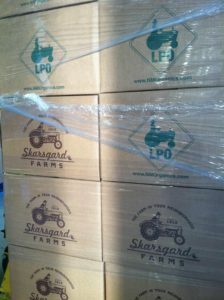 Our farm and many others are so fortunate to be riding this wave of attention that the local food movement receives. But there is one drawback that this energy has brought on and that is a lack of realism. I wish more than anyone that we all could eat within 100 miles of our front door. For us landlocked folks though, this is just not in the cards. Arizona gets too hot in the summer and New Mexico gets too cold in the winter, and Colorado has such a small growing window that if you blink, you might just miss it. So for me, it was in realizing our limitations when I saw our potential. We had to shed the skin of trying to be everything to everyone. We had to concede the fact that someone bakes better bread than our farm, grows better fruit than we can, and milks a happier cow than I would ever be able to do. Basically, there was this very liberating moment that we experienced when we began the mantra “Do what you do well.” I think I even remember my mom saying that when I was coloring as a little kiddo. She probably saw I was not going to be an artist. I mean we do not go to our accountant’s office for an oil change, dry cleaning, and a bowl of warm soup. They crunch the numbers and count the beans. No one expects more from them. But for some reason, the local food movement demands more from producers. And honestly it is not the direction we should be pushing our growers. We need to assess who is good at what, partner up, and stop trying to wear 1,000 hats during the day. So for the past 7 years we have been building these partnerships; which allows our growers to spend more time in the fields and less time searching for a market. 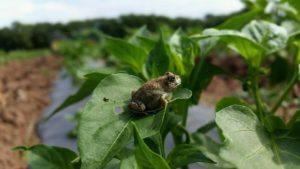 Changing our perspective on what the local food movement should be (can be) has created a paradigm shift for not only our farm and our partners, but also for you our members. 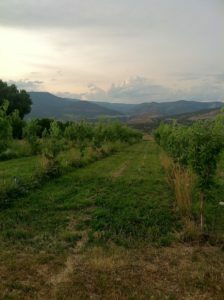 As we encourage a grower to specialize, on say tree crops, they get really darn good at growing fruit. And so all of us get to savor these specialty crops and the grower does not get spread too thin. They can focus on what they do well. So with all of that said, fall is a time for geographic transition for our food production. 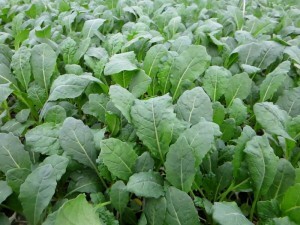 The greens that have been growing in NM, will soon be harvested from the mild winter fields in central AZ. Stone fruits will make way for the abundance of Arizona citrus. Roots that have been watered by the Rio Grande will be irrigated by the Salt. These are the cycles life, the cycles of the seasons, and the cycles of our food. We are so fortunate to have such a strong group of committed farmers, ranchers and producers on our team who understand these limitations that Mother Nature gives us. Additionally all have a deep rooted desire to keep chemicals out of our fields/food and to be champions of social justice and living wages for all Ag producers. By cutting out the middleman (grocery stores), we are able to bring all of this quality food to you at a better value than any sterile and boring store could ever hope to do. Huge reminder, the 20th Annual Green Chile Roast is this up-coming Saturday, 9/24. Well, actually it is only the 2nd Annual, but 20 sounds a lot more prestigious and awesome. The year is beside the point though. The point is an incredible celebration of people, harvests, and food. Come on out and fill your freezers for your winter needs. We will be out here from 9-Noon, 3435 Stanford Dr NE, roasting your favorite greens as well as selling our Hard Cider and offering pasture-raised pork and grass-fed beef. We do not have many steaks left, but we will be selling our beef steaks on a first come first serve basis. Right now we have tenderloins, NY, T-Bones, and some sirloin steaks. You will not find a better deal anywhere. 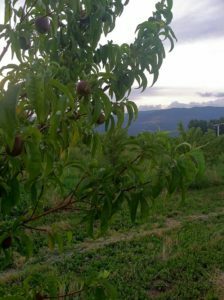 Furthermore, it looks like we will have some perfect stone fruit (nectarine, peach, and plums) for bulk purchase canning. So if you are feeling like putting up some fruit for this winter, come on out to get bulk discounts on fruit. We will have fresh apple cider for you to try and a heap of local NM apples that you can buy to make your own cider. In case you haven’t figured it out by now, what I am talking about is a seriously fun time. It will be right up there with how much fun you might expect to have with floor seats to a Barry Manilow concert. So grab your family and friends and come spend an hour with us on Saturday. I will be around to talk plants or planning your fall garden as well if you have any growing questions. OK, now on to the Harvest Boxes. We are in the midst of one of the best fruit seasons that we have seen in a long time. Maybe the last decade. Our commitment to buy all of the Excelsior Orchards’ 75 acres of fruit has been an incredible partnership for both the orchard and to our members. I hate to even say it, but after eating so much of Paul’s fruit, it is hard to get excited about any other grower. Part of my job is to eat an insane amount of produce (I know it’s a tough job) trying to find the best produce for your family and mine. And the majority of the fruit I put a tooth into, just leaves me unimpressed. I don’t want to sound all snobby, but this is just what happens when you get the best week after week. I cannot stress it enough, but no one in NM or AZ is enjoying the quality of fruit that you are getting right now. We are so fortunate to have such a fantastic partner like we do in Excelsior and Paul. With all of that said, this week will be the largest fruit distribution that we have had in 13 years. 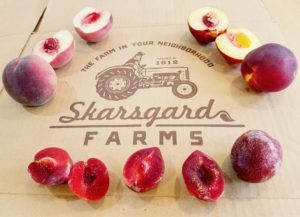 Our goal is to bring you 2,500 lbs of peaches, plums, and nectarines straight from Excelsior. 7,500 lbs of fruit total. And I think we can do it. So do not be surprised to see a predominately fruit Harvest Box this week. Please remember that you can customize your selection. If you do not want as much fruit, substitute some of it out. If you want ALL fruit, we have the quantity to make that happen. So jump on the web site to customize your selection to your fit your needs. Our web site can handle it. Lastly this week, a quick plug for fall work in your garden or around your home landscape. For any perennial tree, plant, or shrub, the fall is The Best time of the entire year to plant. Everyone always assumes you have to plant in the spring, but for perennial plants, the fall is the Goldilocks time. The days are warm (not hot) and the nights are cool (not cold) and it gives plants a perfect time to get used to their new home before heavy frosts set in. Then, in the spring time, your plants will already be established and jump out of their winter dormancy in March. A few things for this weekend. First off, we have never (in 13 years) had as much stone fruit as we do right now. Peaches and nectarines are coming off of our orchard at Excelsior by the truck load. 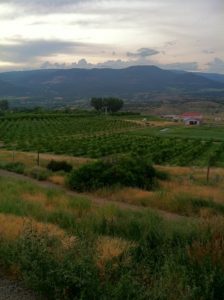 One of the best growing season the Western Slopes of Colorado has had in a long time. Look to stock up on both of those fruit this week. The photo above is a nectarine tree soaking in the high altitude sunshine. We have a couple more weeks of fruit like this, so don’t hesitate to get an order in.